Nowadays photography is considered to be an extremely profitable business. For this very reason, many people decide to transform their hobby into a lucrative deal that will bring lots of money. Those people, who became interested in this matter, should think of launching a powerful website. It will become them with a confidence that their business stands out from the crowd of competitors. 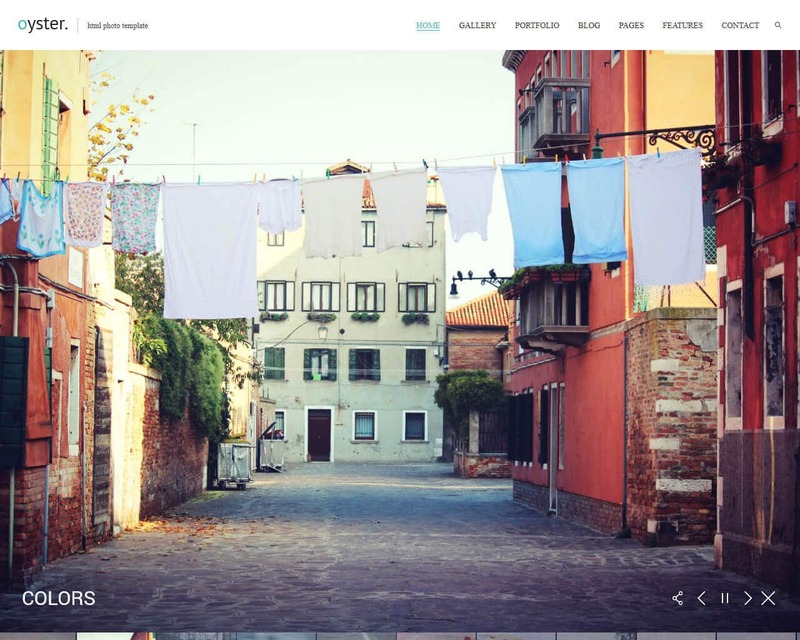 The best way to give people a full look at your professional business is to make use of premium photography website templates. They will assist you in creating a beautiful portfolio of your eye-catching photos that will definitely hit the target. With a vast array of website template presented on the Internet, you may think that it’s difficult to find the most appropriate solution for your future online-project. We decided to ease your problem and chose those themes that will distinguish your website from others. Of course, they have both stylish and powerful look that will make all fans of photography agape with wonder. Without a doubt, it will take you nothing to come into fashion together with one of these excellent templates. They include a great number of gallery types, portfolio variations, and pre-made pages that will assist you in getting a tailor-made look of your website. A remarkable and impressive template that will allow you to change the future of your photo studio and turn it into an extremely popular one on the Internet. It includes lots of advantages that will provide you with a powerful help in building your online-project. To start with, you will get a marvelous collection of ready-made pages that will present your business in an out-of-the-ordinary way. With the help of multiple header and footer layouts, it will be possible to make changes in the appearance of your website and give it a tailor-made look. In order to show a physical location of your company, you can make use of the amazing Google Map. In addition to this, you can take advantage of the engaging Parallax effect that will add some freshness and brightness to your website. Don’t forget to let your people get in touch with your creative staff using a great contact form. 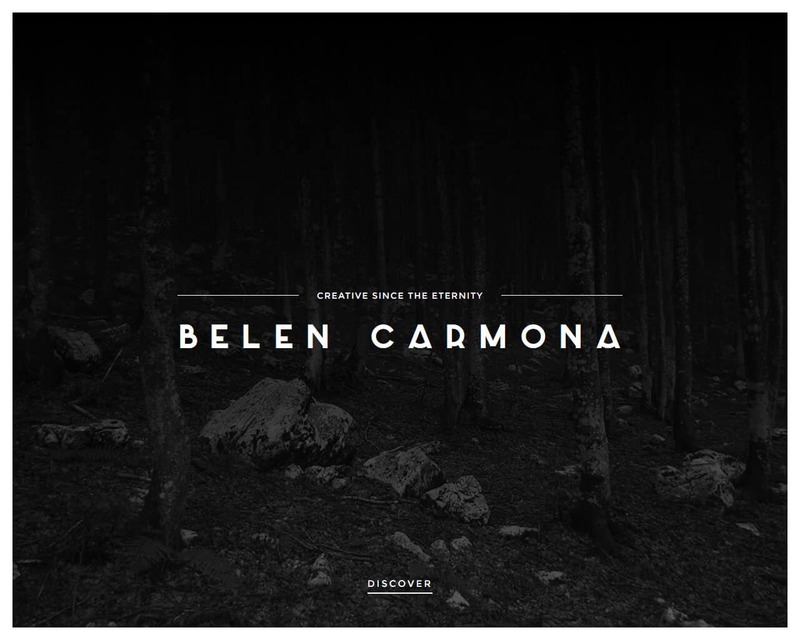 You will also get an incredible stick-to-the-top menu, Google Fonts, hover effects, and many other amazing elements. 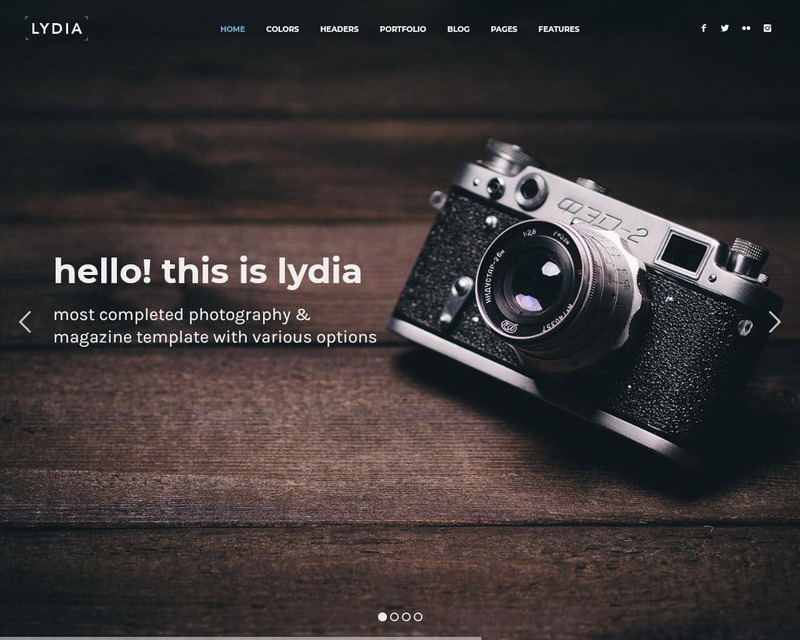 Photographer is a photography and magazine template that has been beautifully crafted and well designed so that it can attract an audience to your site. It is most suitable for bloggers, artists, creative agencies, digital studios, personal freelancers, and other different kinds of business owners who would like to showcase their work in an elegant and professional manner online. 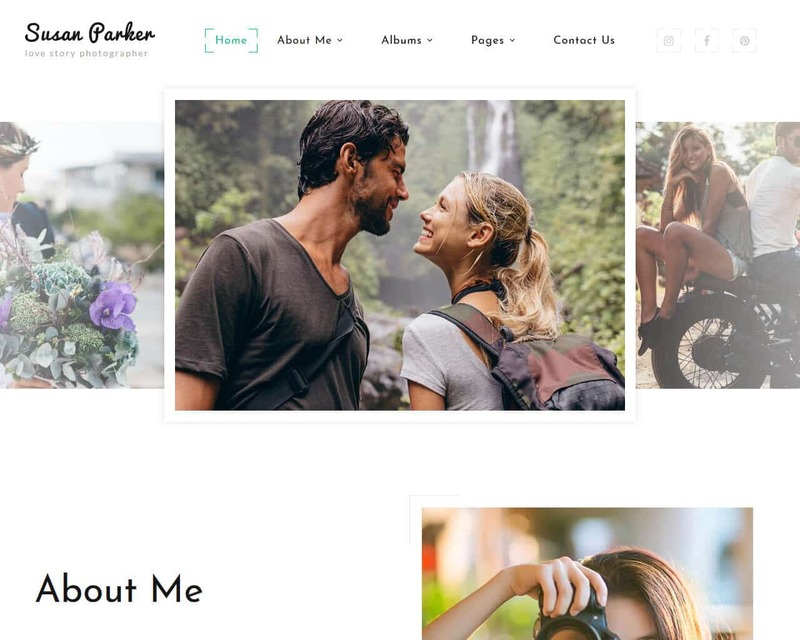 Photography template comes with great features that are all necessary when it comes to making your site look more appealing and attractive, and these features will also make your site very fast and reliable. Some of them are 11 color options that you can comfortably choose from according to the ones that you like best, or the logo of your company, three different headers, eight home layouts, ajax portfolio and one-page option, and so on. In addition to those features, you can use this template on all browsers as it is fully compatible. 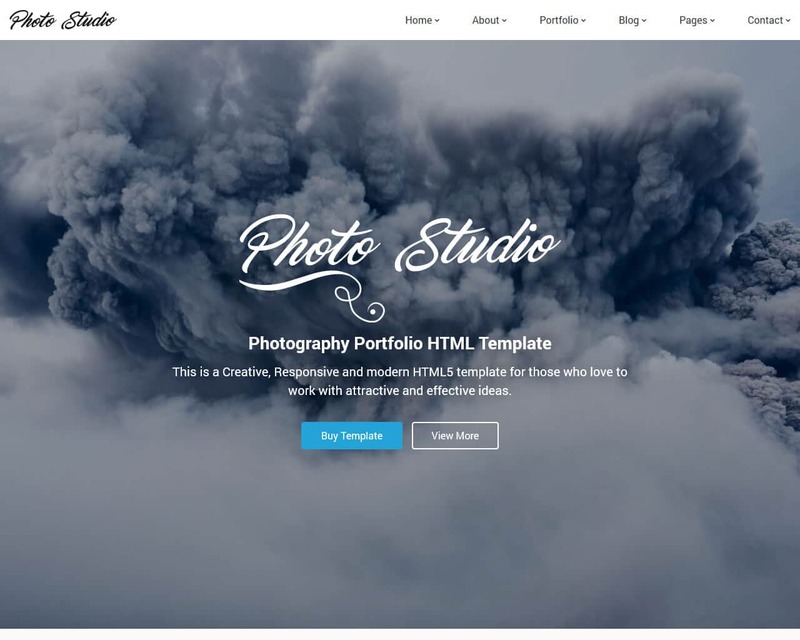 Corallo Studio is a stunning template that will give you the opportunity to launch a remarkable website regarding your professional photo business. By means of the minimalist design mixed with various vibrant pictures, it will be no doubt that your potential customers will adore your online-project. In order to showcase your impressive works in the most stylish way ever, you need to take advantage of different gallery layouts. In such a way, you can assure your target audience of your modern approach to your work and get their attention without any difficulties. Moreover, you can make people believe that your team will provide them the most creative and eye-catching photos ever using a stunning blog functionality. Thanks to it, you will get a wonderful chance to share with your audience some additional facts about your work and everything connected with it. If you want to make a user-experience of your readers even better, you can add a great Parallax effect to your website. A minimalist solution that will assist both professionals and amateurs in the world of photography in creating a modern website. Without a doubt, its inviting look will draw the attention of your core audience. It comes alongside a bunch of good-looking pre-made pages that will allow you to get a unique look to your future online-project. Together with this out-of-the-ordinary template, you will get 18 albums and 16 galleries. Thanks to them, you can be completely sure that your beautiful photos will capture the attention of every visitor of your website. It will be also possible to brighten the look of your online-project up by means of incredible animation effects and transitions. By the way, you can also set your eyes on the excellent background video that will add a special attractiveness to your online-presentation. In order to present some hot offers that should make people pay more attention to your services, you can use a marvelous website slider. Oyster is an amazingly designed template to fit all your professional needs in a fun yet sophisticated manner. If you are looking to create a site where all your clients can get all they need for you and where you can showcase your skills, then this template is your perfect choice. Oyster is a photography template that will help you to transfer your work from the typical way that you have kept them to a perfectly organized and designed canvas. Oyster is rich in features, and it has extra optimized capabilities that will make your site stand out and also stable. Some of these features are, an easy and well-commented code that you can use effortlessly, cross-browser compatibility, sticky menu, flow gallery and ribbon gallery, easy color management, full-screen design, isotope support in portfolio, coming soon page and many more, I mean with this template, the list of features is endless. A creative theme that was designed for those people who are interested in showcasing your splendid photo gallery in the most professional and remarkable way. Actually, each online-project regarding photography made with the help of this amazing solution will play out in fresh colors. There are a lot of reasons to be completely sure in this fact. It comes together with a marvelous homepage that includes such powerful options as an image background, content slider, and video background. Thanks to a wondrous portfolio, you will get the opportunity to show off your pictures and make people order your stunning photoshoots. By the way, you can always post all essential information about your company using an impressive about page. Furthermore, you will be able to share different interesting facts about your work using a great blog functionality. If your visitors have some questions, they can always go to a user-friendly contact form and ask you some questions. 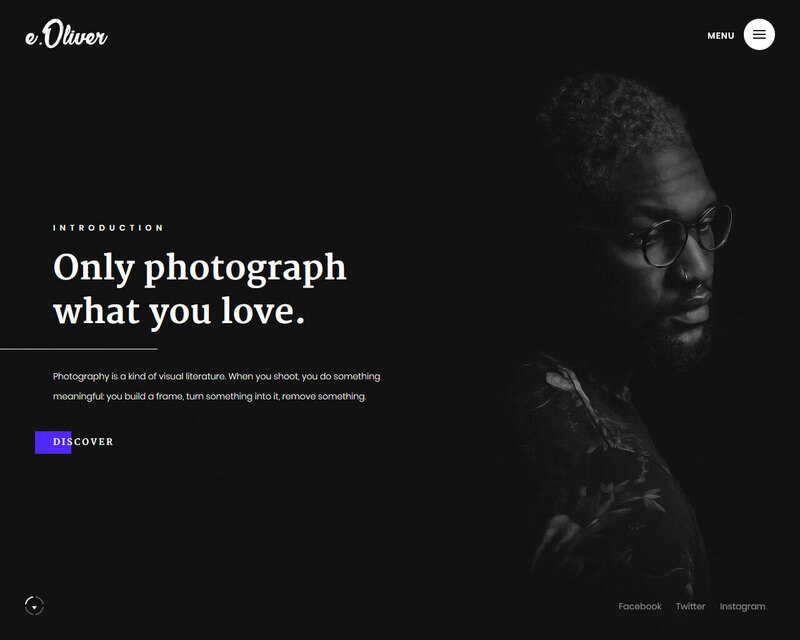 Oliver is a minimalistic solution for photographers and anyone in the creative field who wants to showcase their skill and talents in an online platform. It is most suitable for, portfolio, resume, and personal blog. This template has been designed with the best and trendy tools to ensure that your site meets the expectancy of your audience or the online market. Oliver has all the best features that are necessary to improve your website and make it look more appealing to the eyes of your viewers. The features are so many that the list is endless but here are some of them, font icons and excellent SVG graphics, BEM, SASS, good documentation, easily customizable, Google fonts and maps, font awesome, functional photo gallery and more. This template is a very good option if you want a site that is up and running within a short time. Quaint is a brand new solution that will impress your imagination with a flexibility and bunch of amazing features. If you want to get unlimited possibilities that will give you a full freedom of customization, you should certainly pay your attention to this powerful template. Together with this eye-catching theme, you will get a wide range of pre-made pages that will make it possible to share various details about your services and their advantages. Thanks to a wonderful collection of animation effects and transitions, you will be ready to add some visually-attractive tricks to your future online-project. Furthermore, your visitors will be definitely happy to take advantage of different user-friendly web forms that will make your website become more trustworthy. For example, a marvelous contact form will allow your potential readers to communicate with your team in order to find out more about your photography studio. 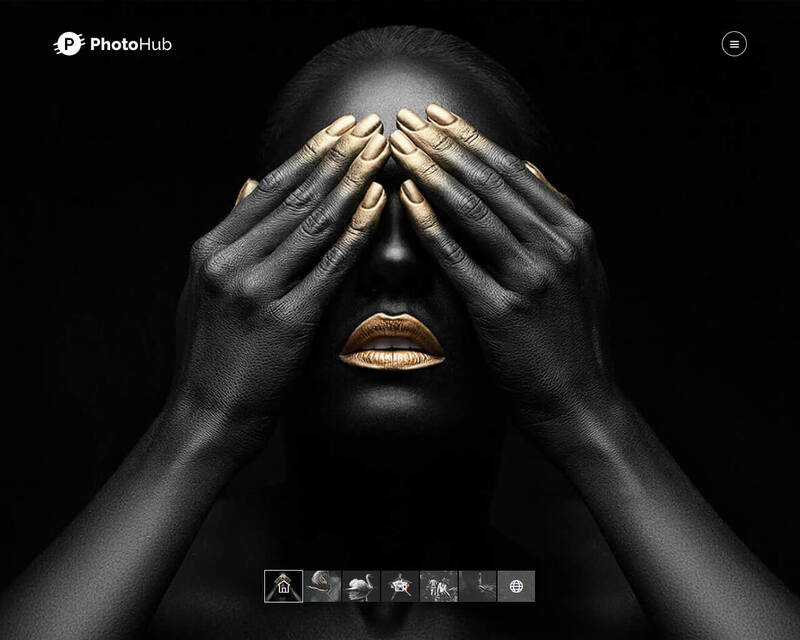 You will also get a stunning gallery mixed with some amazing hover effects will give you a great chance to present your high-quality pictures in the best possible light. 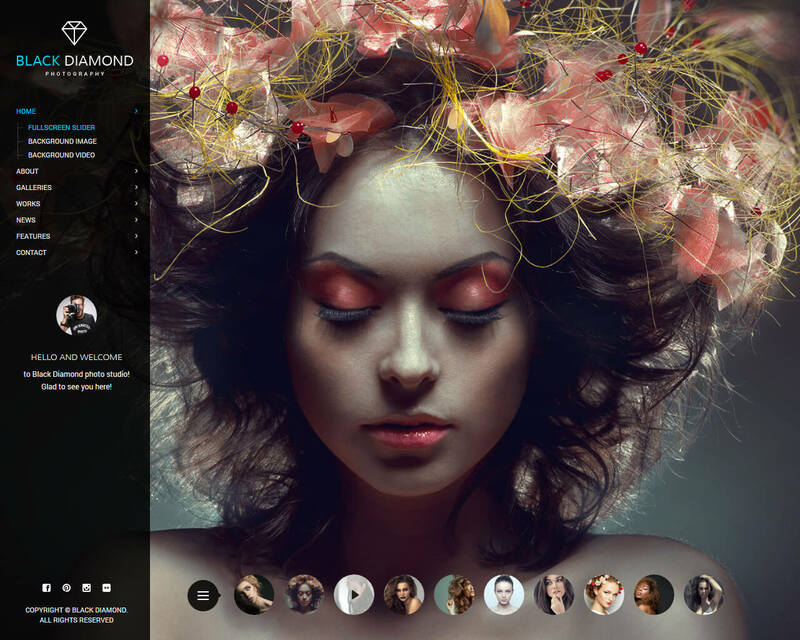 Diamond is a sleek, sophisticated, artistic and professional template. Sometimes it becomes very overwhelming to create a professional portfolio website as it demands a lot of time, money and energy. With all the hustles and bustles of your day to day life, your dream of owning a website may not become a success. However, you do not need to lose hope as Diamond template is here to save your day. This template will help you create that long-awaited website in just less than 2 hours. It has been built with the most amazing and modern tools that will make your site look better than the rest. It comes with full screen design, wall portfolio and gallery, different blog layouts, full-screen video, coming soon page, a well-commented code that you can effortlessly use to edit your site, and it is also fully compatible with all the modern and old browsers. 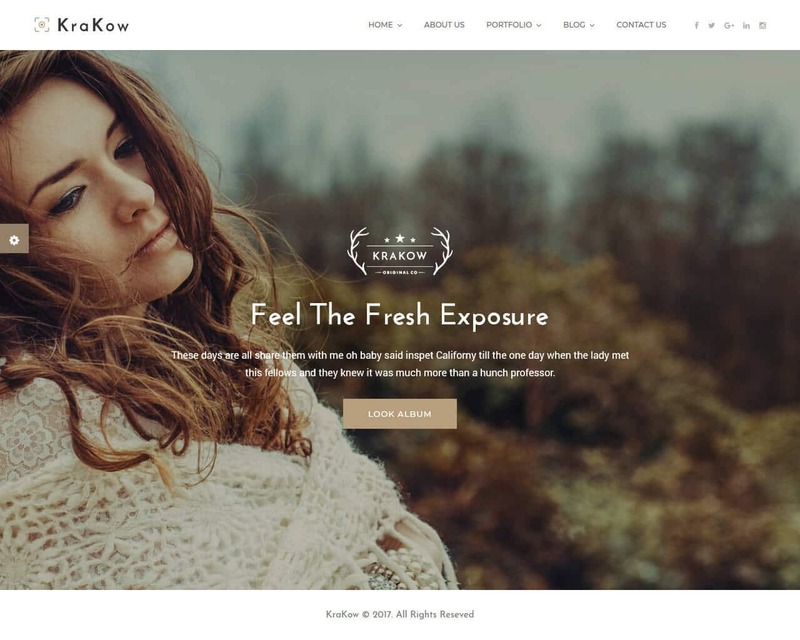 Krakow is a photography template whose sole purpose of development is to help you create an outstanding and sophisticated photography website where you can showcase some of your amazing talents and skills. This is a perfect way to communicate with your audience and give them what they ask for. Certainly, you will do a great business and also improve your site views as this template speaks your website will speak for itself even before you market it. 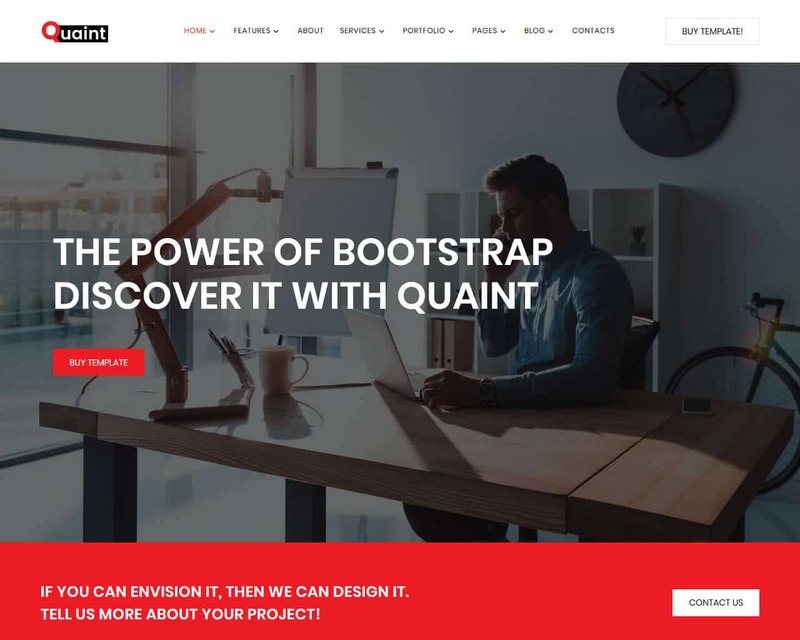 This template has great features that will help you create your site in no time and also make it very fast and reliable. 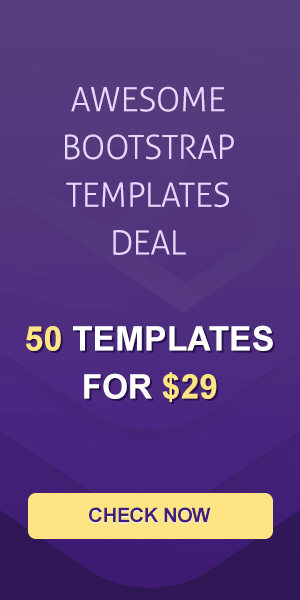 It has awesome blog pages, 20+ valid files, slider revolution and this actually saves you money, unlimited sidebars, bottom footer widgets, social links, a very clean and commented code, pixel-perfect design, cross-browser compatibility, custom font support, Google map with multiple locations and many more. Krakow is definitely a good option for you. If you consider yourself to be a great photographer who provides people with wonderful love story pictures, you should certainly spread the word about your talent. With the help of various pre-made pages, you will be able to tell people about your photo studio, its advantages, and present all reviews of your satisfied customers. A stunning appointment manager will make it possible for your clients to book a meeting directly on the website. In such a way, you will save their time and allow people to entrust in your services. It also has a user-friendly booking form that will make it possible for your clients to order a photoshoot and immediately get their desired feedback. Don’t forget about a collection of magnificent gallery types that will show off your admirable images in the best possible light. Among them, you can find the most popular variations that include masonry, grid, and cobbles. 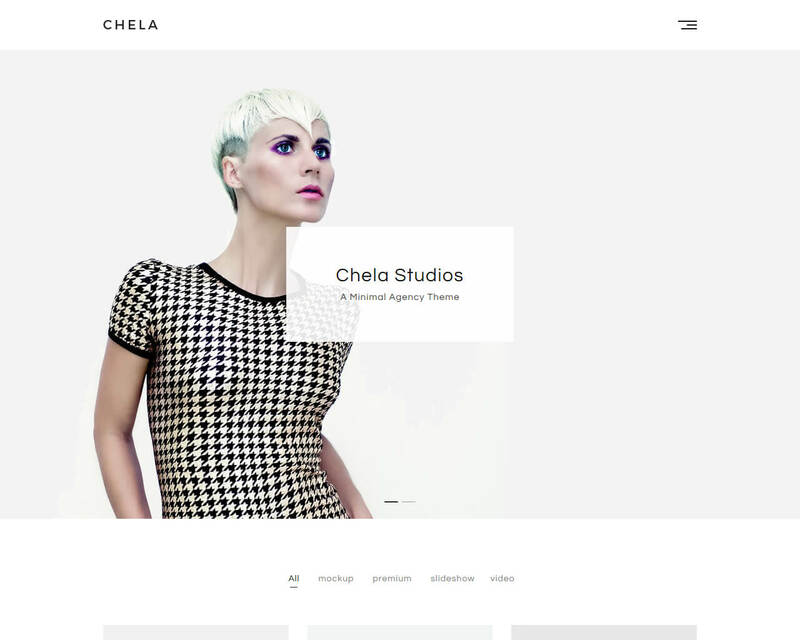 Chela is a clutter-free theme that will make your photography services become widely-recognized on the web and impress your target audience with amazing images. You will be happy to make use of different stunning options that will become your assistants in building the most stylish website. It comes together with a boxed and full-width layout that will certainly catch the eye of every person who will visit your online-project. You will also get a great page header with a background image slider that will make it possible for you to arouse interest in your potential customers. In order to showcase your excellent pictures at their best, you need to pay your attention to a wide range of portfolio types. You can present images in the different number of columns and make them look extremely attractive. 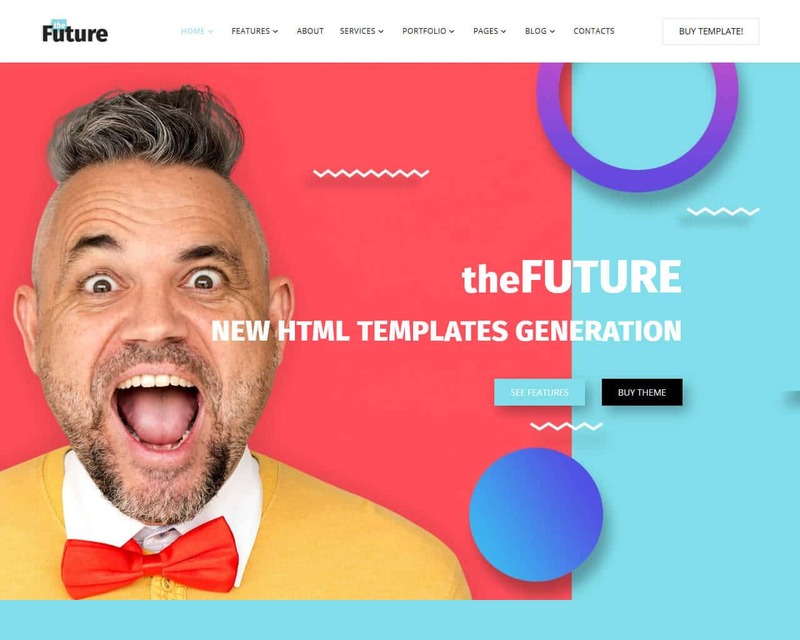 Without a doubt, people will be ready to rely on your services because this amazing template also includes a wonderful about page, contact page with a powerful contact form, and many other trustworthy features. 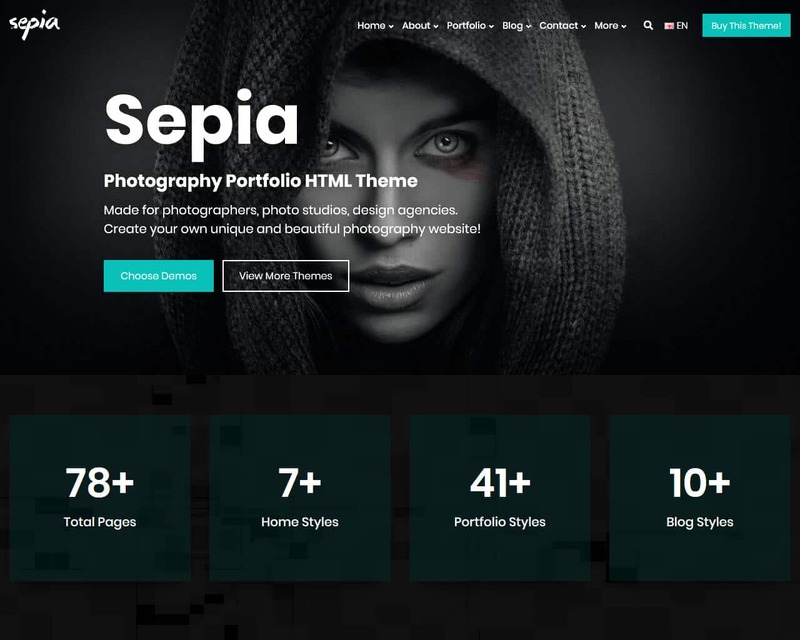 Sepia is an amazing template that is based on the Bootstrap framework which is an amazing tool for creating reliable templates. It is ideal for photographers, design agencies, photo studios, and more. 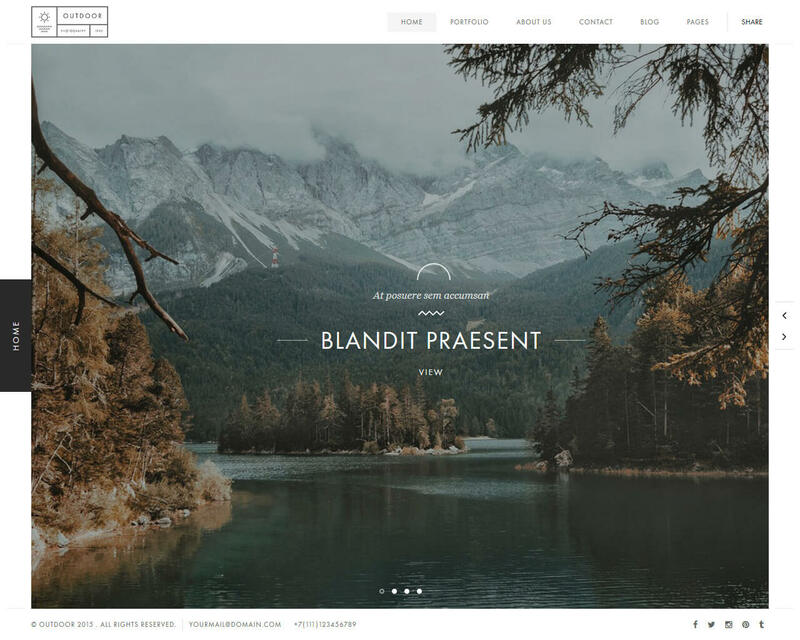 With this template, you can easily create a professional and beautiful website in just 2 hours as everything is prepared for you. This template is a guarantee that your site will look amazing and therefore, will attract a huge audience and hence bringing in more business. Sepia comes with incredible features that are essential for your website, and they include, a light and dark version, round style, seven skin colors that you can change according to your preferences, but you are not limited to adding your own choice. A clean and organized code that you can work with to change whatever you do not want in your site or even add what you want to add. 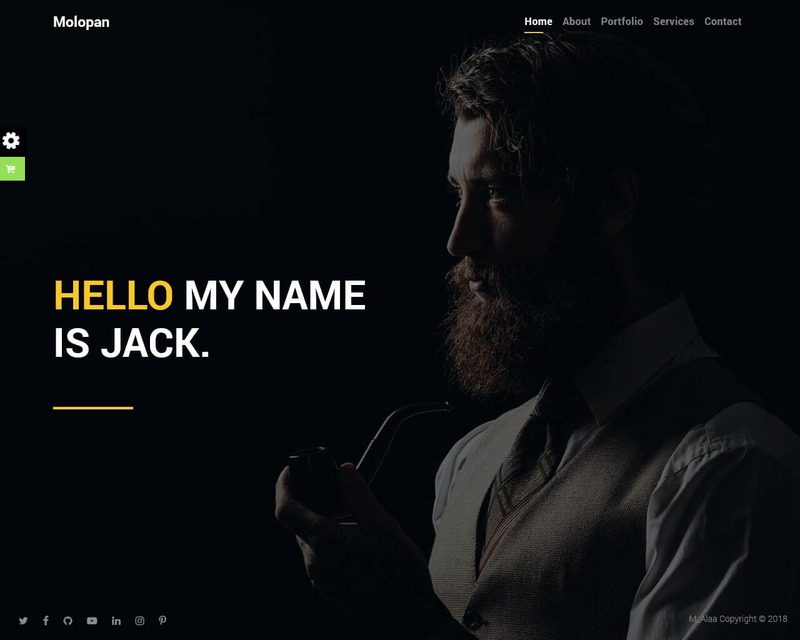 Malopan is a tailor-made template that will make sure that your core audience won’t pass by your amazing website. Its extraordinary design that comes together with a beautiful typography and stunning palette of colors will catch the eye of people who consider themselves to be fans of the professional photography. As you can understand, this superb template was created for those who are interested in presenting their talent in the creative and unusual way. Together with this captivating theme, you will get a bunch of essential options that will assist you in showcasing your works. By means of this powerful solution, you will get the opportunity to show off your high-quality images and create amazing portfolios. You can be sure that this solution will provide you with one of the most effective ways to make people become interested in your services. Furthermore, it includes a great contact form that will assist your customers in getting in touch with your team. A bright and lovely template that can be called a marvelous variant for people who want to promote their photography studio and get lots of new customers. Thanks to 9 remarkable variations of the homepage, it will be possible to make certain that you online-project will distinguish itself from others. By means of this great solution, you will be able to present your team members, all achievements that your staff made, upcoming projects, and pricing plans. In order to make a user-experience of your visitors even more amazing, you should definitely pay your attention to a side-menu, carousel slider, and contact form. If we were to talk about showing off your creativity, you can do it using a powerful grid and masonry photo gallery. You can also show different Youtube videos if you want to get even more attention from your target audience. In addition to this, you will get an unlimited number of custom portfolio pages that will make your photos become extremely popular on the web. 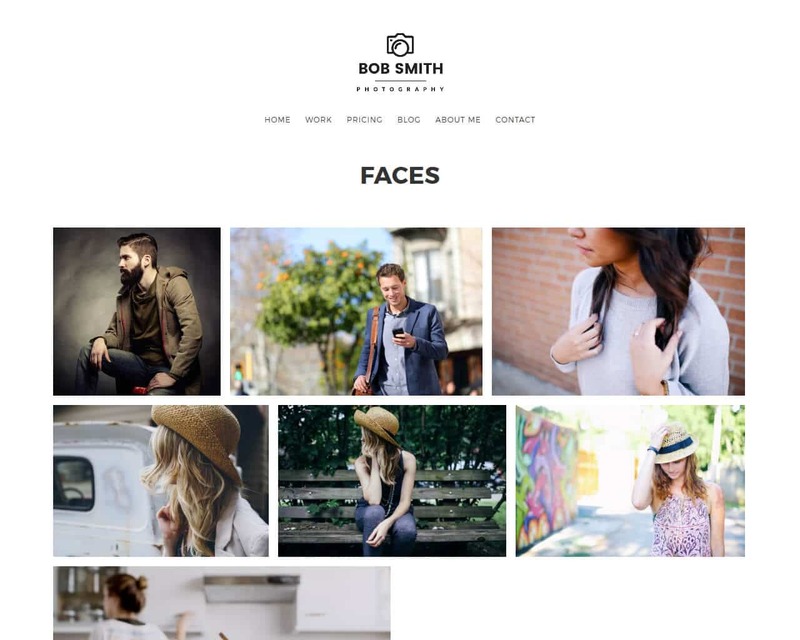 This template is specifically created for creative photographers. Its purpose to give them an amazingly looking site where they can showcase their amazing talents and skills. Photographer has a minimalistic and distraction-free design that is very attractive which means that your site will gain a greater audience and views hence bringing in more business even before you market it. With this template, you get features like, complete blog system which means that you can use all post formats as they are supported. You will also get good and detailed documentation, a well-commented code that is very essential when it comes to editing your site, so the easier, the better, an already working Ajax contact form, 30 and above social media icons. Certainly, this template will take your site to the next level in terms of growth and business. 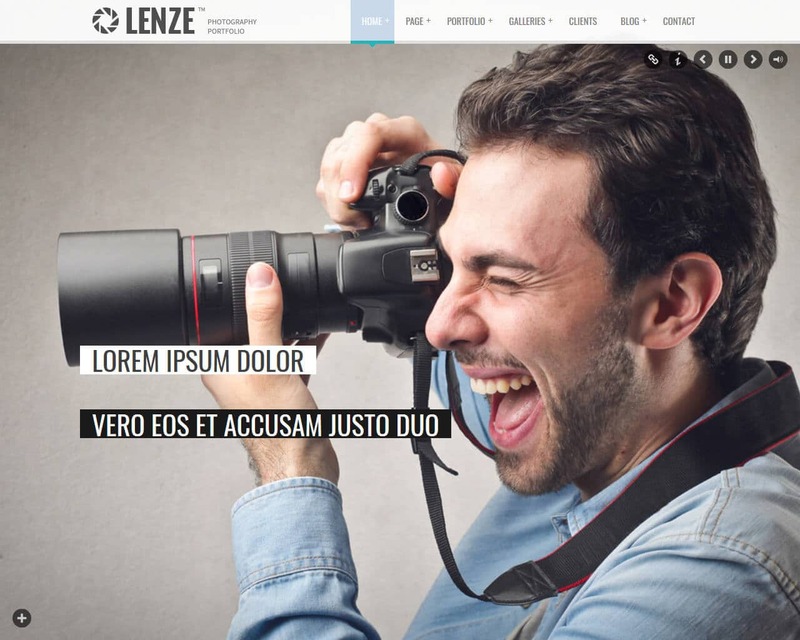 Lenze is a perfectly designed template for portfolio photography. It has been built with the most popular and most trendy designs to make it suit all your need without omitting none. This template will work perfectly in making your site look great as it will also improve your online presence. Because of its beautiful design, you a guaranteed an increased number of views and also a great audience which will in return help you sell your name all over. Lenze comes with amazing features that are all of great essence when it comes to creating a website. It comes with three different homepage layouts that are the box style, full width, and full width. Media grid plugin that will help you control the layout of your items grid according to your preferences. This template is most suitable for, creative business and agency, photography and portfolio websites. Outdoor is creative and portfolio template that is built with the most modern and unique tools to make your site look sophisticated, modern and also professional. Outdoor works best for Designers, photographers and anyone else who feels they need to showcase their work to clients in an attractive, easy and effective way. Outdoor comes with many amazing features that go hand in hand with what you want to showcase. You get multiple slideshow homepages, six different style homepage, four different style portfolio page, nine single portfolio pages that are all different, full-screen background, YouTube video background, working AJAX PHP contact form, touch and swipe and so many more. You also get a very easy code that you can easily work with to edit your site. This template is fully compatible with almost all browsers whether old or modern. It will suit you best if you love fun while still working.